Biography of Caroline Miller | Friends of Caroline Miller, Inc.
Caroline Eileen Pafford was born on August 26, 1903 in Waycross, Georgia. She was the youngest of seven children. Her father was Elias Pafford, a school teacher, and her mother was Lev Zan Hall Pafford. After graduating from Waycross High School, she married her English teacher, William Dews Miller. The couple then moved to Baxley, Appling County, Georgia. Caroline had been inspired by the pioneer women in her family and the community stories she heard. She would drive out into the county with her three sons, interviewing and talking with the older residents, listening to their stories of the past. She would then often head to Barnes Drugstore and write the stories down while sipping on a Coca-Cola. She incorporated the stories, the speech, the dialects and the intents into her book Lamb in His Bosom. In 1934, Lamb In His Bosom made its way from the tall pines of Georgia to the world. Caroline’s first novel, Lamb in his Bosom, won the Pulitzer Prize for literature. Caroline was the first Georgian to win this esteemed award. The book also won the French Prix Femina Award for American Literature the same year. This changed Caroline’s life forever. She received an honorary Degree of Letters from Oglethorpe University in 1935. Travel became part of her life and she often spoke to various organizations. William D. and Caroline divorced in 1937. Caroline then married Clyde Hosea Ray, Jr. and moved to Waynesville, North Carolina. Caroline and Clyde had a son and a daughter. 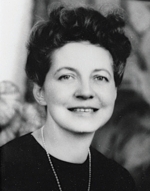 Caroline continued to write, had a few short stories published as well as the novel Lebanon in 1944. Clyde Ray, Jr. in 1976. Caroline moved to home where she had a quiet, serene existence. She continued to write. When she died in 1992 at the age of 88, she left several unpublished manuscripts.